To most people, the life of a millionaire feels almost unrealistic: Spending your time however you want, driving a car people look after (was that a Ferrari?) and not answering to anybody. This doesn't seem like something most people could also have. But if you’re an ambitious financial advisor, you might have a hunch that becoming a millionaire is possible for you. And it’s true: With the right mindset, habits and big enough goals, you could make a 7-figure income. In this episode, you’ll hear exactly what the world’s millionaires consider the key to success so you can catapult yourself into their world. 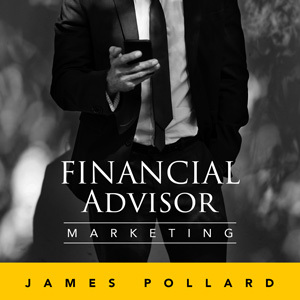 Go to the TheAdvisorCoach.com/Newsletter and pick up your free 90 minute download called “5 Keys to Success for Financial Advisors” when you join The James Pollard Inner Circle. As a financial advisor, marketing is the key to your success. Whether you’ve been in financial services for thirty days or thirty years, this podcast will help you become a better prospector so you can get more clients with less stress. James Pollard shares his insights on what it takes for you to build your book of clients with less stress.